Before Auction RCB has retained their players by giving the retained players Salary for IPL 2019. So we will check the whole list of the salary of Royal Challengers Banglore Players in IPL 2019. Royal Challengers Banglore have never won a single trophy in 11 seasons yet they have a huge fanbase because of the star players. The main reason behind this is captain Virat Kohli and his lethal combination AB de Villiers. I think AB de Villiers has more Indian fans than his home country South Africa or any country has. Who doesn't love to watch him play? There were some rumors that Virat Kohli is dropping from captaincy in IPL 2019 and AB de Villiers will lead RCB in IPL 2019. 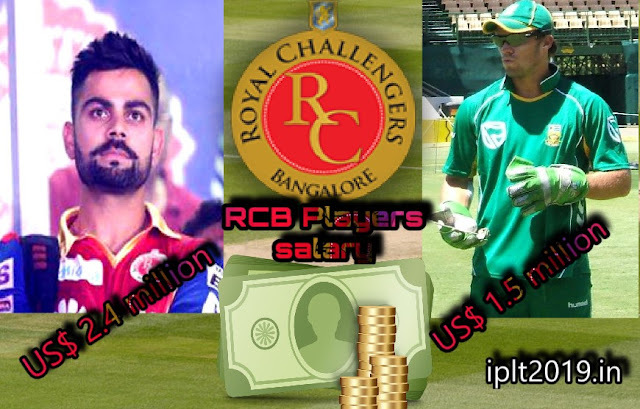 Scroll below for Salary of Royal Challengers Banglore Players in IPL 2019. Obviously, Virat Kohli is the most expensive player of Royal Challengers Banglore by getting the salary of ₹17 crore (US$ 2.4 million). And he has proven himself worthy of that amount. Virat Kohli is the Second highest run-scorer after Suresh Raina. Now talking about released players and sold, RCB shocked everyone by releasing Quinton de Kock. RCB has sold Quinton de Kock to Mumbai Indians and now he has scored a century on just 55 balls in MSL. Seems like he is in good form. So now Quinton de Kock will play for Mumbai Indians in the upcoming season of Indian Premier League, IPL 2019. This is a smart buy of Mumbai Indians and will help MI. So that is the complete list of Salary of Royal Challengers Banglore Players in IPL 2019 who are retained by Royal Challengers Banglore and will play for RCB in 2019.